Here's the very first issue of the All About Moose Alerts Ezine. You'll always know when a message is from me by looking for [All About Moose Alerts] in the subject line or the "The Moose Man" in the "from" email address. I just wanted to send a personal "Welcome". Even though this email is going out to thousands of people, I write my emails with one person in mind ... YOU. I learned a long time ago that the "missing element" of doing business online is "personal interaction". Too often list owners see subscribers as just another number on their stats page. I know you're real. You're just like me. Maybe you don't love sailing or the beach as much as I do, but we've got a lot in common. So, let's get personal, okay? I just wanted to drop you a quick note to say "I'm glad our paths crossed - and I hope I can have a positive impact upon your moose activities." and "A Happy New Year". Watch your inbox for the next issue of All-About-Moose Alerts: We will be announcing a contest. As a subscriber you will always get first notice. Our newest webpage is a new Moose Hunting Tip looking at the differences between home range and core areas. PS: Feel free to forward this Ezine to your friends. https://www.all-about-moose.com Always updating with new recipes, pictures, hunting tips and stories. I promise to use it only to send you All About Moose Alerts. Runlock Hunting Rope take this versatile rope with you on all your outdoor adventures and never cut your rope again. 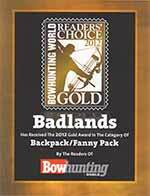 Read why we only use Badlands Backpacks and why you should too! Nina wrote: "The ideal site for everything you ever wanted to know about moose but were afraid to ask ..."
Mark said: "Just wanted to say how great of a site you have. I must admit it took a while to get used to all the links but the info on moose and moose hunting is excellent. Keep up the good work!" Shawn commented: "Awesome website guys! I'll be spending some time on it for sure. I have had Moose but never hunted them. My favorite meat!!" Chris said: "I just want to say, great site you have! I been hunting moose all my life I'm from Fort Nelson BC. I'm so obsessed with moose I even got a moose rack tattoo on my back!" MaryLou emailed: "Thanks for the great website! I just love moose...there's just something about them."